GoPro has launched some of its most advanced action camera unit: GoPro Hero5 Black that possesses all amazing features. One of the most awesome additions into this camera series is the digital image stabilization ability that provides amazing results for video recording. With all such amazing improvements it is being rated higher by all professionals but people are also not able to forget another powerful action camera - Hero4 Black. If, you have already bought Hero4 and now thinking about whether to upgrade it to new one or not then this article will be helpful for you. Let us have a look on detailed comparison between Hero4 Black and Hero5 Black. The recent launch of GoPro Hero5 Black is really a proud moment for GoPro because action camera lovers are highly excited about this new addition into GoPro series. It is believed to have so many improvements over Hero4 Black so let us have a detailed look about how these both generations differ from each other. As GoPro has squeezed few new and advanced features into GoPro Hero5 so it is naturally heavier and larger in size as compared to its predecessor. The overall weight of Hero5 Black is 118grams even when all accessories are connected but on the other side Hero4 possesses maximum weight of 87 grams. Now as this previous generation camera unit also demands additional housing that may increase the overall weight of camera up to 150 grams. 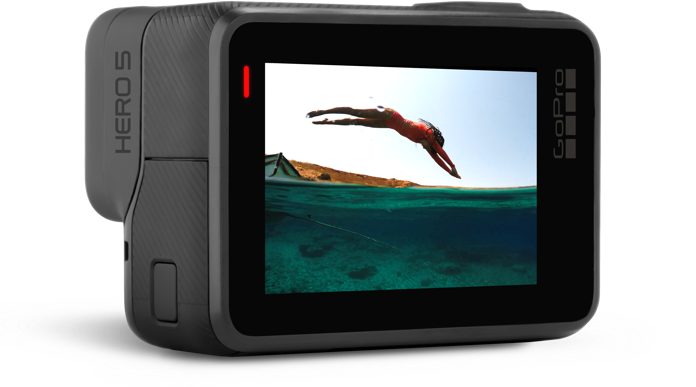 Although, this latest addition to GoPro series is developed with a slimmer construction but this camera is actually little taller and wider as compared to Hero5 Black. One of the biggest feature extensions in GoPro series is the advanced touch screen that assists users in easy navigation. This feature was absent in Hero4 Black but you can enjoy easy navigation with Hero5 now. It was not possible to control GoPro Hero4 Black with the voice commands. Most of athletes were demanding this feature in new camera release so that they can control their videos on the go so finally GoPro added this amazing feature to Hero5 Black. You can now control all major functions with basic voice commands. The battery life of Hero4 was less with its 1160mAh battery but with the new innovations you will find a larger battery inside Hero5 Black – 1220mAh so users can now expect about 20 to 70 percent improvement in battery life with GoPro Hero5 Black. You will never find much difference in the video capturing abilities of both action cameras as they can equally share the 4k resolution at 30fps, 1080p at 120fps and 720p at 240fps. But the best thing to know about Hero5 is that it offers much improved settings and a range of features to make better selections during recording process. With this latest camera you will be able to get less distortion in videos and footages use to be much smoother. If we talk about photos captured from these action cameras then Hero5 Black as well as Hero4 Black both provides 12Mp resolution. But with the advanced unit you will be able to get more options for recording as well as for selection of fields of view. In simple terms we can also say that GoPro Hero5 Black provides much cleaner and sharper results for stills as compared to Hero4 Black. One more interesting feature to talk about with this latest camera addition is the video stabilization facility. You will be glad to know that manufacturers have added high class video stabilization feature to their latest design so that it can deliver smooth results even after facing jerks on the go. Although this facility is not incorporated with 4k resolution mode but for 1080p resolution you can avail amazing benefits. This facility was not available in GoPro Hero4 Black. In order to remove the fish eye distortion from camera results, GoPro designers have added latest linear field of view to GoPro Hero5. Its effectiveness is being loved by all GoPro lovers and is considered to be one of most innovative addition to this series. There is no doubt that Hero5 Black is a highly advanced and sophisticated device as compared to its cousin. Even if we talk about audio quality then it is found much better in case of Hero5 Black as compared to the other competing device. Professionals have observed a big improvement in audio quality of Hero5 Black as compared to Hero4 Black and it resulted in noise free interactive videos. GoPro has really added so many efforts for designing Hero5 and it can be observed easily from its awesome features. All features are much improved as compared to its predecessor and innovation is well reflected from each part of this latest camera. Although Hero4 Black offers perfect value for its price range but if you have higher budget then it is good to go for Hero5 Black. Those who wish to develop highly stabilized videos during their adventurous tours must prefer to buy Hero5 Black.